A decentralized digital identity framework (“DDIF”) is an innovative solution using a decentralized database to alleviate inherent inefficiencies and cost overruns in the current due diligence business processes. 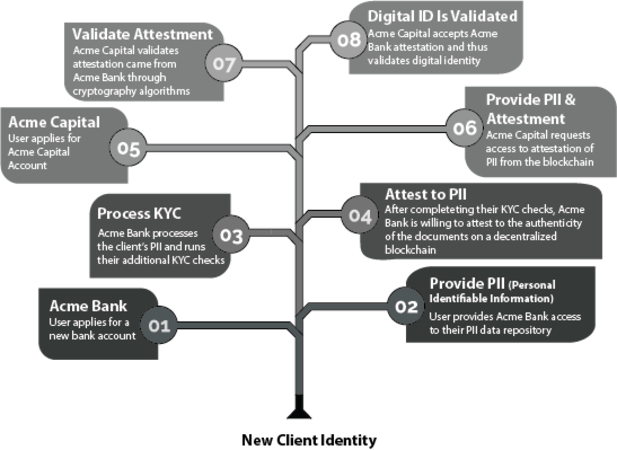 The current KYC process requires each service provider to carry out redundant tests to authenticate a client’s identity, categorize their risk level, verify the source of funds and execute background checks to discover any documented nefarious activity. Every individual and entity engaging in financial services must go through this process at the beginning of a new relationship and are subject to annual reviews and updates. This process is time consuming and costly for both the client and vendor. The blockchain, at its most basic representation, is simply a decentralized database: free for any entity or individual to access, view and store data. It provides a transparent and secure interface for people and institutions to securely share information. As such, the blockchain provides the ideal technology to create a decentralized, verifiable and secure location to develop a digital identity framework. A DDIF would have three participants: a user (an individual or entity), a service provider and an attester. In any given transaction, a participant can only act in one role; however, a participant’s role can change from one transaction to the next. This model provides the ability to share, verify and streamline the KYC process while maintaining the same world class standard the Cayman Islands is known for. Please refer to the diagram above for an overview. In our model above we have a new client represented by an individual, a Service Provider – known as “Acme Bank” – and a second Service Provider – known as “Acme Capital”. The individual will first sign up for a bank account at Acme Bank, then contract out Acme Capital to manage the capital. As Acme Bank is the first service provider to come in contact with the individual, they will perform the full due diligence process on the client. After they perform this process, they attest to their verification process validating the individuals’ documents and background checks. Acme Capital has a trusted relationship with Acme Bank and they can accept the attested data minimizing their due diligence process.